Here is another example of color flatting that I completed recently. It’s another pin-up, but a bit more detailed than the last one I posted. I also grabbed the original source for this one from Digital Webbing. There was an art and coloring contest there, one in which I did not participate, and this was the sample line art provided to use for coloring in the contest. I wish I could find the original artist to properly credit the person here, so if anyone reading this post knows, please let me know so that I can edit this and properly give credit to the original artist. The first picture below is the original line art composited with the flat colors, while the second picture is just the flats by themselves (i.e. the bit that I did for this pin-up). Once again, this one just happens to accidentally be mostly appropriate colors. When flatting a single-character pin-up it is much easier to try and use potential final colors for most things along the way and get those decisions out of the way. When I get around to being able to post some sequential pages of color flatting, you’ll get to see more of the semi-random flatting that is more typical of this kind of work. 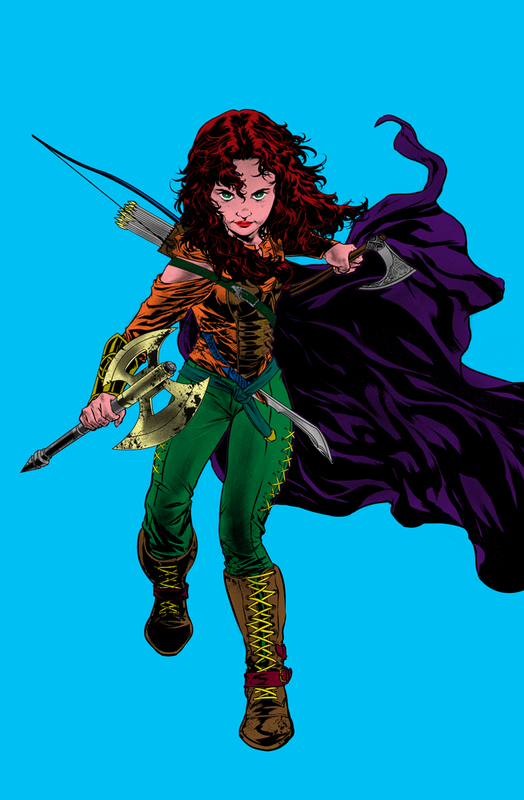 Not being intimately familiar with this particular character, and knowing nothing except her name, Jane, I had to guess in some places about costume detail… but believe I hit most of the major points with flat colors. There are a few places where the costume might be broken down further, depending on the colorist intentions for finishing this piece. But otherwise, I think a pretty solidly flatted pin-up page with lots of little details to pick out. Remember, if you are interested in requesting my services as a Flatter, please use the Contact page and provide me with as much information as you can about your request. 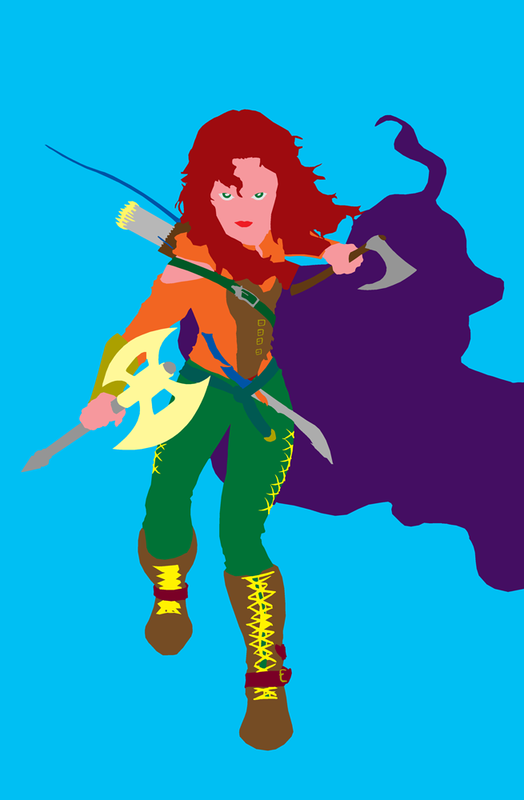 Most of my usual work is either hand-drawn and colored or vector drawing in Illustrator. When I draw (or finish) digitally, the coloring usually happens in Illustrator as well. But, that’s not how most of the comic world works. Some people hand-draw, some people digitally render, but in either case… the digital coloring process typically happens in an application like Photoshop. It doesn’t have to be Photoshop, but a lot of colorists use it, and that’s what I use, so that’s the perspective from which I’ll usually talk. Perform any digital cleanup or level adjustments to your line art to make it solid black and as clean as possible. 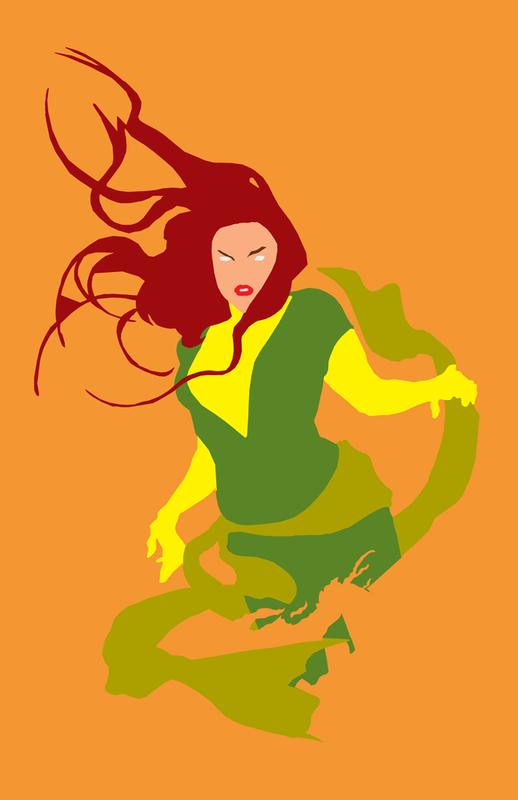 Lay down flats (flatting) for all the bits on the page that you are going to be coloring. Render lighting, shadows, and other effects to characters, objects, and backgrounds. That’s a bit of oversimplification, of course, but that’s it in a nutshell. Earlier this year I realized that in order to work in mainstream comics, and especially if I wanted to collaborate with others outside of my own creations, I needed to learn and develop skills working in the manner in which most professionals work. To that end, I began learning how to flat pages. There are lots of different ways to flat, and this isn’t going to be a tutorial on flatting anyway… but some ways produce better flats than others. The main point in the flats is to provide easily select-able areas upon which to define final color and apply effects to finish the illustration later. Flatting can be a time-consuming process, and it is something that many professional colorists will sub-contract out to have done for them so that they can focus on the effects work. Here is an example of a pin-up illustration that I flatted recently. 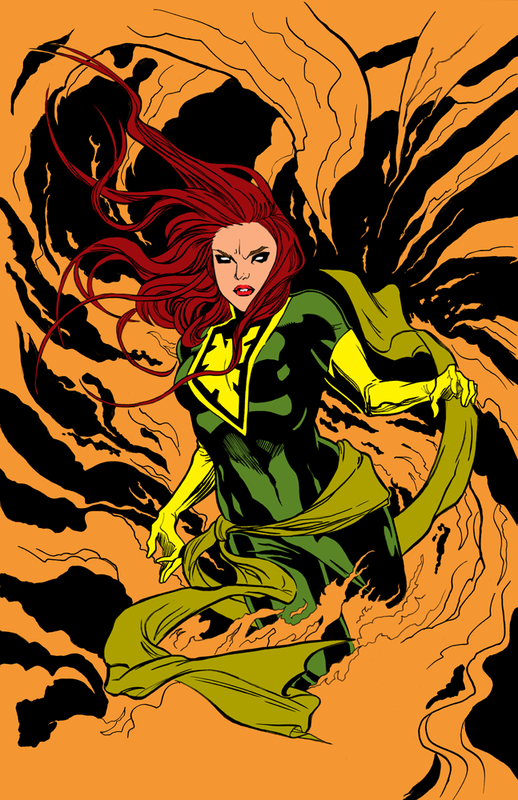 It’s an illustration of Marvel’s Phoenix character and was penciled by Renae de Liz and inked by Rob Norton. I grabbed the original line art from Digital Webbing where they had posted this as part of a collaboration project going on there. 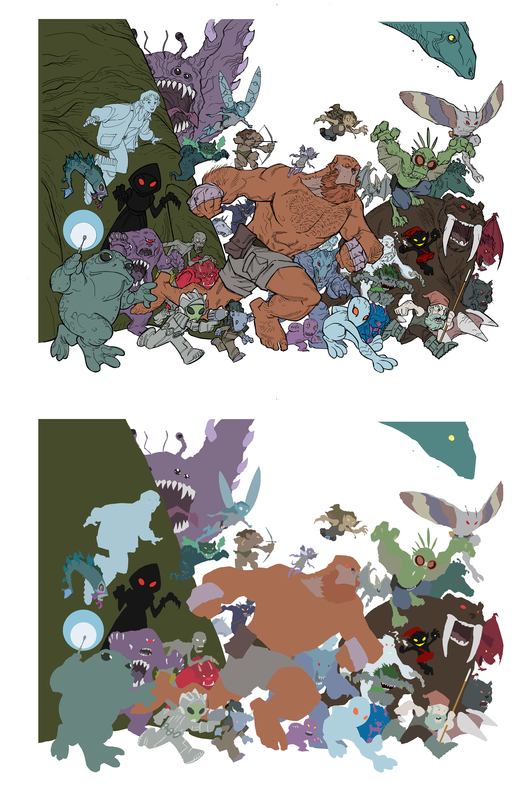 The first picture is the flats composited with the line art, and the second picture is just the flat colors alone (i.e. the part that I did). What you mainly go for is unique colors for all the individual elements that might be colored or shaded differently later, and no instances of different objects that touch having the same color. This makes the work of the colorist later tremendously easier to be able to go and highlight each selection quickly and apply reference colors and effects. Note that while this illustration uses mostly appropriate colors for different parts of the character, flatting doesn’t require it. Often the person doing the flatting will not know what the final colors will be and semi-random color choices will be made at this stage. It’s not important to get bogged down trying to guess the color scheme during the flatting stage. It’s most important to block out every individual thing that needs to be colored. There are some bits of this piece that could be broken down further, depending on the colorist intentions for the piece. Easy examples are… the fire in the background could be broken into different pieces… and the cloth wrap around her waist could be broken down to the different layers and even the different twists that show alternate sides of the cloth as it flows. You should always check with the colorist before you begin work to find out how far they want you to break down layers and costumes. Some will want everything broken down, while others will only want you to hit the large bits and they will make those smaller decisions as they apply their style to things. FYI, this is the sample page I supplied to get the gig working on the Tellos Project. I will be posting another blog post about another recent pin-up coloring flat I produced that is a bit more detailed and, I think, more impressive than this one. Stay tuned! If you are interested in requesting my services as a Flatter, please use the Contact page and provide me with as much information as you can about your request. So, I meant to get back to the comic strip last weekend, but then this other thing happened… The Mike Wieringo Tellos Tribute is a two volume hardback graphic novel set featuring creators from all over telling a huge Tellos story in honor of Mike Wieringo, with proceeds from sales of the book going to the ASPCA. Volume I came out last month, but copies are still available directly from the Web site, which is the only way you can order it. Volume II pre-order cutoff is tomorrow, July 10th and the book will actually be released the second week of September. You should care because this is an awesome collection of work from fabulous creative people… you should care because Mike Wieringo was a tremendous talent and an even better person, and is definitely missed in the world… and you should care because proceeds benefit the ASPCA. But, if it helps you to care a little more… I’ve been working on Volume II of the book pretty much non-stop for the past week! I’ve been providing assistance to several different colorists working all over the book in order to help them get their work done faster. My contribution has been flatting the pages in preparation for the colorists to come in and work their flair and magic to make things really pop! In a separate blog post, I plan on explaining a bit more about just what flatting is in this context… and I’ll even show some sample pages I’ve done that helped me get onto this particular assignment. 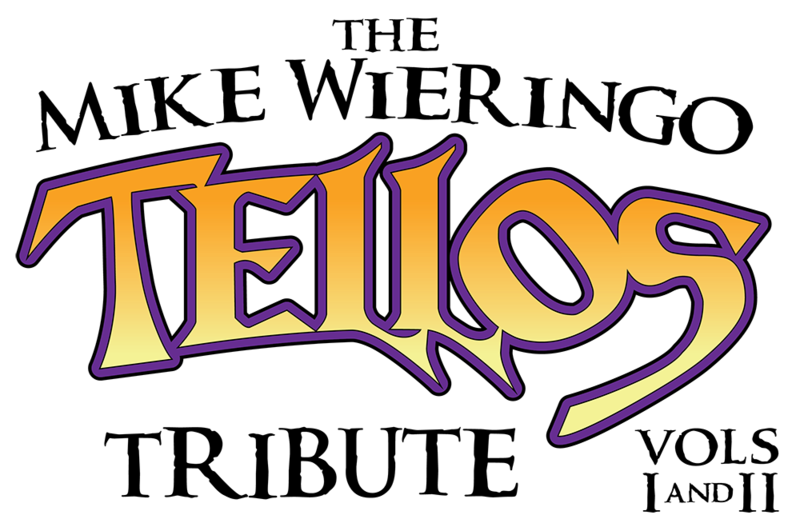 What I can’t do, for now, is I can’t show any of the pages I’ve worked on for the Tellos project nor can I talk about the contents of the pages or the story. Check back with me once the book has been published, and I’ll see if I have permission at that time to make some blog posts and share the actual work I’ve done for this book. But, this will be my first official professional credit. When Volume II comes out, I’ll be officially part of the team as a “coloring assistant” or something like that. So, I’m getting to work with a lot of cool new people… doing some fun work… benefiting a good cause… and being a part of a project that is truly special given the subject of the tribute. I met Todd DeZago and Mike Wieringo countless times at comic conventions over the years… even got to have a spontaneous lunch once with Mike Wieringo and Scott Hampton when I had gone to their studio in Hillsborough, NC to pick up a piece of art that I had bought from Scott Hampton. The thing is, I remember when those guys (Todd & Mike) were just getting started, and doing great work but not getting the big lines at the shows… It was cool for me to get to spend a lot of time chatting with them, but the year the first Tellos book came out… I was very happy to see they had a long line to get to their table! I remember telling them I would miss the days of the long chats, but was happy to see them getting the recognition they deserved. It was tough when Mike Wieringo passed away about ten years ago.. so being a part of this project has a special meaning to me, as I’m sure it does for a lot of the contributors.